Enhanced DTS Surround Sound Modes & Presets - Custom DTS HeadphoneX 7.1 Surround Sound modes combine with enhanced Turtle Beach genre-specific presets to further immerse you in your favorite games, movies and musicDynamic Chat Boost – Communicate game-winning plays to your squad clearly thanks to automatically boosted team chat audioActive Nois.. Surround Sound Ready for PC Gaming - Optimized to deliver immersive Windows Sonic for Headphones surround sound. *Windows Sonic for Headphones provided by Microsoft for compatible Windows 10 PCs (and Xbox One). Also compatible with Dolby Atmos for Headphones (Additional purchase may be required. )Flip-Up Mic - Turtle Beach's renowned high-sensitivit.. Durable Comfort - A sleek metal headband with a suspended pad and swappable magnetic memory foam ear cushions ensure unmatched comfort so you can focus on the game.Pro Gaming Mic with TruSpeak Technology - Communication is crucial in esports. Points are won and matches lost with a single command, and the Elite Atlas's crystal clear noise-cancelling..
Elite 800 Premium Wireless Surround Sound Gaming Headset for PS4 Pro/PS4/PS3 Turtle Beach’s Elite 800 isn’t your ordinary gaming headset. Uncompromising, the ELITE 800 is the ultimate 100% wireless, active noise-cancelling gaming headset for PS4 Pro, PS4 and PS3, featuring ..
Lightweight & Comfortable Design - The RECON 50P WHITE features Turtle Beach’s latest lightweight and comfortable design, and is perfect for those hours-long gaming sessions. The full-size ear-cushions are wrapped in synthetic leather, and fold flat when not in use. 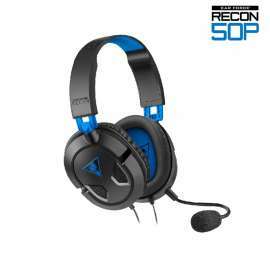 Versatile Compatibility - The RECON 50P WHITE works great with PS4™ controlle.. Compatible with most PC and Mac computers, tablets and mobile devices Along with the latest Xbox One and PlayStation 4 controllers for wide-ranging use. 40mm drivers Along with neodymium magnets create a rich, dynamic soundscape with deep bass and crisp highs. Noise isolation Blocks ambient sounds to ensure imm..
Discription : Go to the next level in your comfort and your game with this lightweight Turtle Beach® Recon 60P gaming headset. Level Up Your Headset The Recon 60P ear-cups rotate flat for a comfortable over-ear fit as the large 40mm speakers provide booming sound and crystal clear audio for a truly immersive game experience that lets ..
Discription : Go to the next level in your comfort and your game with this lightweight Turtle Beach® Recon 50P gaming headset. Get Back to Basics Grab the lightweight Recon 50P, plug it in to your PS4™ Pro or PS4™, and play. It’s that simple. Experience a comfortable over-ear fit as the large 40mm speakers provide crystal clear audio .. The TURTLE BEACH® STEALTH 600 is the latest wireless surround sound gaming headset for PlayStation®4. Debuting an all-new modern style, the STEALTH 600 delivers virtual surround sound plus chat audio through powerful 50mm over-ear speakers, and features Turtle Beach’s renowned high-sensitivity mic that can be flipped-up to mute. For comfort, the ST.. The TURTLE BEACH® STEALTH 700 is the latest premium wireless gaming headset for PlayStation®4, with DTS Headphone:X® 7.1 surround sound and active noise-cancellation, plus Bluetooth connectivity to the new Turtle Beach Audio Hub app. The STEALTH 700 features an all-new modern style and delivers immersive surround sound plus chat audio through power..
Take your wireless gaming audio on PS®4 to spectacular new heights with the Turtle Beach® Stealth 520. The Stealth 520 is loaded with the latest cutting-edge features like Turtle Beach’s exclusive Superhuman Hearing™, which allows you to hear enemy footsteps sneaking-up from behind and distant weapon reloads. And DTS™ Headphone:X 7.1 S..